Carrie is now showing in cinemas everywhere and is distributed by Sony Pictures. Please see your local cinema guides for times. Here is the question that the 2013 remake of Carrie encourages you to ask yourself, is there really such thing as a good horror film remake? And here we are not talking horror movie good where the film scares you and therefore it is a success, we are talking about whether it is actually a well made film. Or does that really matter when it comes to horror movies, as it only matters whether it scares you. The latter question's answer tends to vary depending on the person who is answering, but the first question leans more towards the negative. Carrie, which has been reimagined for the 21st century, reminds us why some films should be left untouched and remain in the time they were made. Although the Kimberly Peirce's film has done a fine job at recapturing the suspense of the first film, this horror classic doesn't gain anything from being remade. Instead what we have is a rather unremarkable teen horror flick which leaves you completely unsure about what you should be taking away from it. Carrie White (Chloe Grace Moretz) is a young girl who has lived an incredibly sheltered life at the hands of her overly religious mother, Margaret (Julianne Moore). Carrie was home schooled for the majority of her life until forced to attend a normal high school and since then she has been an outsider and chronically awkward and shy. When she receives her first period in the girls change room after swimming at school, she is terrified as she was unaware what her menstrual cycle is. The girls in the change room, headed by Sue (Gabriella Wilde) and Chris (Portia Doubleday) ridicule Carrie by chanting and throwing tampons at her. Ms Desjardin (Judy Greer) breaks it up and punishes the girls involved, which is when Chris gets banned from attending their senior prom. She blames Carrie for her misfortune and plots a cruel plan to humiliate Carrie in front of the whole school. What nobody suspects is that when Carrie is pushed too far, her kinetic powers cause all hell is about to break loose. Even though you want to view Carrie as a stand alone film, for those who have seen the original it is very hard not to compare the two. Rather than being the un-nerving and disturbing horror film which the 1976 film was, the 2013 Carrie seems just like an atypical teen horror film that is not at all original in it's delivery. In particular, in the scenes with Carrie's teenage classmates, we could be watching any film in the teenage subgenre which have been released in the past few years. The montage scenes of the girls and boys getting ready for the prom contain the same images and music as we have seen in so many films before it and Carrie's tormentors are like the girls we have seen in films such as Mean Girls with some Stephen King injected into them. It is obvious that what director Kimberly Peirce is trying to do is appeal to this target audience and update Carrie in order to fit into the young adult world of today. By doing this, all Peirce does is add to the pool of films which are soon to be forgotten after their release because there is nothing remarkably or positively original to remember them by. As is the case with many remakes, the horror elements of the first are taken and inflated to make ideally more scary. What would be a horror remake without more blood and gore? Or a crazy religious mother who is even more crazy and religious than before? How about we also make Carrie in her rage like a real supernatural being with bizarre body movements like we have seen in other horror films? However, the saving grace for Carrie and the thing we can rejoice about when comparing it to the original is that there is still a great deal of suspense leading up to the infamous prom scene. There is a constant feel of dread and tension as you know what is coming up and there is also a feeling of excitement to see how Carrie does lash out with her powers. The last five minutes of the film doesn't hold the same power in this way and is a completely lack lustre finale. The dialogue of this ending doesn't give you any sense of closure and although many horror films do not like to give their audience's closure as a scare tactic, this ending just leaves you more confused about what you are meant to take away from the film. The CGI used in the film is very touch and go. There are some fantastic moments, in particular the blowing up of a service station and shattering of the car, yet there are also some moments where it lacks, such as in the house towards the end. The use of slow motion and repetition towards the end of the film does create more emphasis in the scenes which they are employed in. Chloe Grace Moretz does well as the title character in Carrie. However, there are certain characteristics you wish she could have portrayed. In particular, Moretz does awkward and lonely well, but there isn't really a great deal of character development over the course of the film. There is of course the craziness she takes on in the prom scene, but her rage is completely unexpected when you think about how Carrie never seemed to be getting close to her breaking point. She is simply awkward, then almost happy, and then murderous. There is no smooth progression to any of these emotional states. Moretz's Carrie is sweet and vulnerable, but Carrie is far from being to role of her career. Julianne Moore is very good as Margaret White. She is very creepy and you find yourself at times being far more scared of Margaret than of Carrie. Moretz and Moore do have great on screen chemistry together. Gabriella Wilde is likable, but her role as Sue Snell doesn't allow for her to really do that much. Portia Doubleday gives an interesting performance as Chris. In all honesty it feels as if Doubleday has just been directed badly. She gives off an air of great potential, but her timing and deliverance of her dialogue is off the mark. 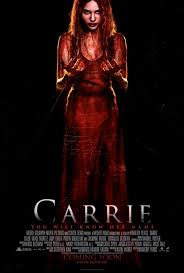 Carrie was again reinforces the fact that the real horror classics shouldn't be tampered with. There is no such thing (as of yet) as a wonderful horror film remake, and a remake being made so that teenagers of today can relate to it more isn't an idea that always works, as Carrie has shown us.